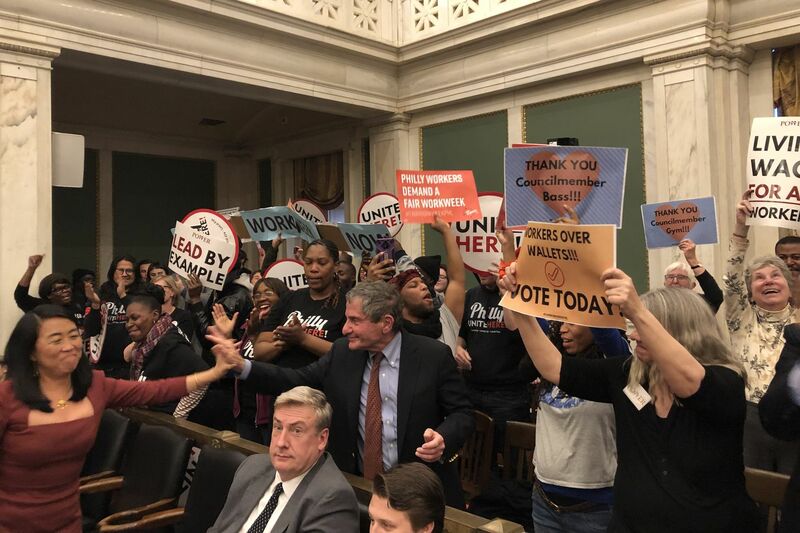 Councilmember Helen Gym (far left) rejoices with other supporters of the "Fair Workweek" scheduling bill after Council voted to approve it Thursday afternoon. “I’d be able to provide for my family," Wiggins said. The bill would require employers with more than 30 locations and 250 employees to give workers two weeks' advance notice of their schedules and offer “predictability pay” if schedules change after that. It also would requires employers to offer available shifts to existing employees rather than hiring new ones, a move that could help bring part-time workers, like Wiggins, closer to full time. A coalition of traditional labor and “alt-labor"